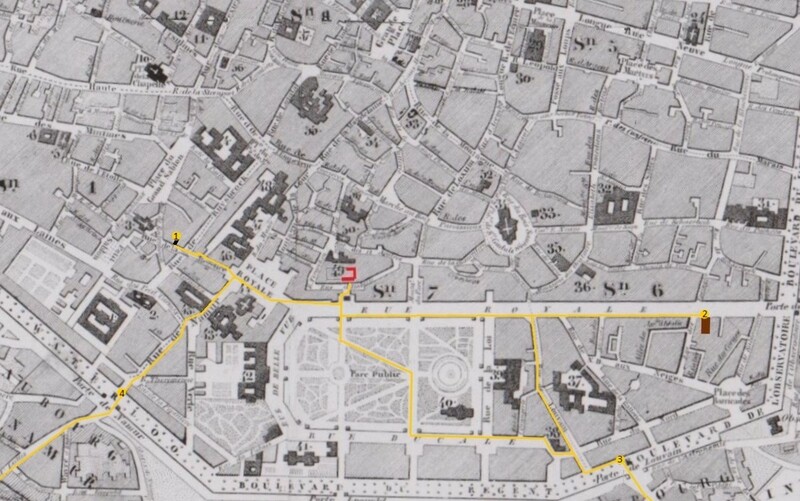 The most efficient routes to walk to the Brontës’ other friends all began with climbing up the Belliard Steps, at the opposite side of the street from the Pensionnat. After passing by Belliard’s statue they were on the Rue Royale. Going left it was a straight walk to the Wheelwrights at the Hotel Cluysenaar. To walk to the Jenkinses or the Dixons meant going right. 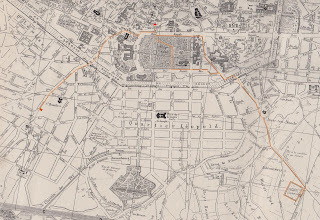 For the walk to the Protestant cemetery later on Charlotte will probably have crossed the street to enter the Park, although she may have varied the way she walked. 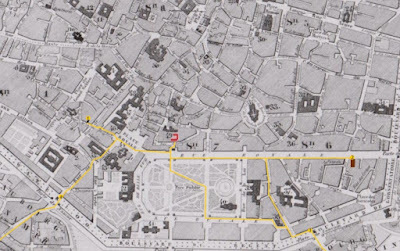 In the previous Koekelberg mapping article I stated that Mary Taylor would have written that 1841 letter to Charlotte Brontë, in which she “spoke of some of the pictures & cathedrals she had seen – pictures the most exquisite - & cathedrals the most venerable,” from the Koekelberg pensionnat. It’s probably not true, as a closer look at the documents show. Mary wasn’t staying there yet. An intriguing letter of 9 September 1841 has survived, written by Martha Taylor, in Koekelberg, to Ellen Nussey. It is also a somewhat confusing letter, as it seems to show that Mary Dixon was already in Brussels in September 1841: “You must write to me sometimes. George Dixon is coming here the last week in September, and you must send a letter for me to Mary to be forwarded by him.” Earlier in the letter she wrote that she was “going to begin working again very hard, now that John and Mary [Taylor] are going away” (obviously back to England). Presentations by members of the Brussels Brontë Group have been a fixture of our calendar for the past six years. In past presentations Eric Ruijssenaars has led us on a virtual tour of the Isabelle Quarter, and Myriam Campinaire has unpicked the Gothic elements in Jane Eyre and Wuthering Heights. Last year, in talks enlivened by readings and recitations, Judith Collins spoke on Disguise, deception and concealment in Jane Eyre and Paul Gretton on Some literary themes and sources of Wuthering Heights. 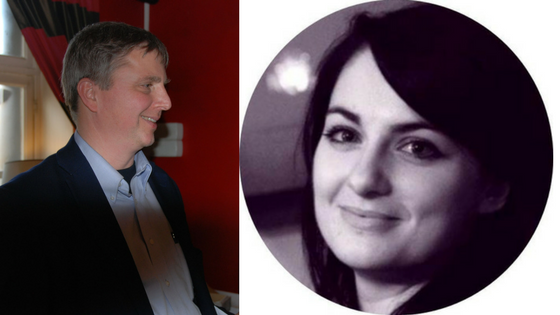 This year’s speakers, Jones Hayden and Ola Podstawka, both of whom are on the Brontë Group committee, are familiar to members – Jones as leader of our Brontë tours and reading groups and Ola as moderator of one of the reading groups. Members also know them for the presentations they have given in the past, Jones (among other subjects) on Profanity and Scripture in The Professor and Ola on the influence of Constantin Heger on Charlotte Brontë’s fictional heroes. 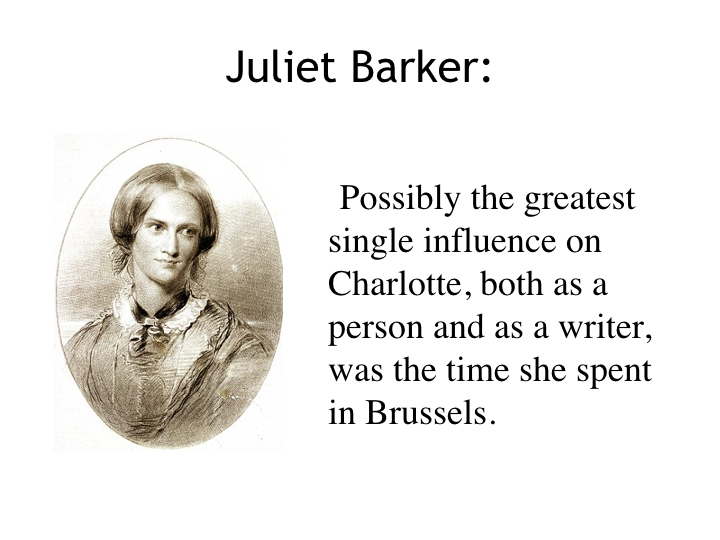 This year it was Jones who took a look at Heger’s influence on Charlotte, specifically on her novel Jane Eyre, in a talk called The influence of Charlotte Brontë’s Brussels experience on Jane Eyre. 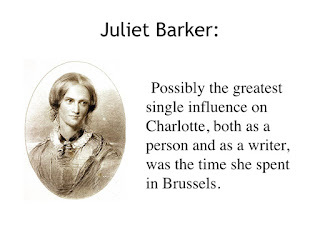 Juliet Barker’s opinion that ‘Possibly the greatest single influence on Charlotte, both as a person and as a writer, was the time she spent in Brussels’ set the tone for the talk. Many readers of Charlotte’s best-seller wondered how an unmarried clergyman's daughter could write so powerfully about passion. 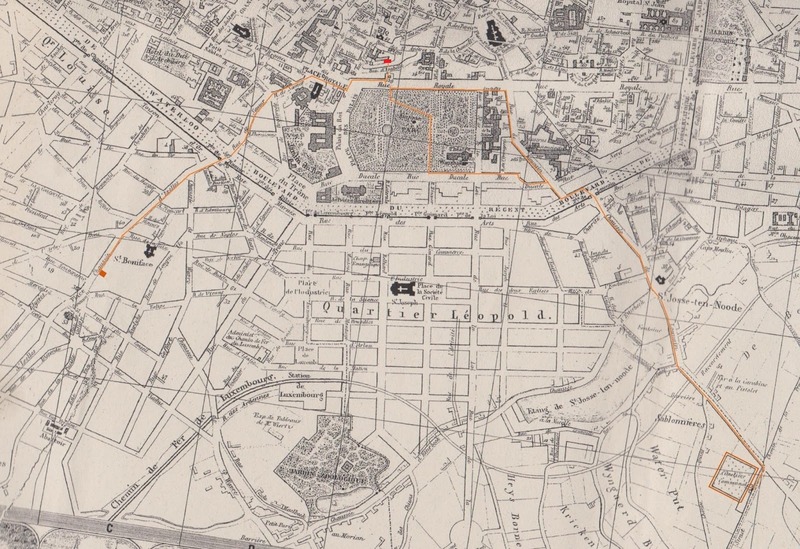 The answer, Jones told us, lies in Brussels and in her Belgian tutor Heger – the person who most influenced her. It was her time in Brussels that made her a great novelist. 2 March, Wednesday – W: 3 to 9 C, bright morning, continuous rain after 2.15 pm for the rest of the day (10.2 mm), a strong wind sets in in the evening from the southwest. The newspapers have sad reports about the damage done by the storm in the country’s provinces. At a concert at the Société Royale de la Grande-Harmonie works by Rossini, Mozart, Beethoven and others were performed. Rossini appears to be probably the most popular composer in Brussels in this year. Donizetti scores very well too. The newspapers give a fascinating insight into the classical music world of these years too, ranging from well-known to totally forgotten composers.